Western blot analysis of whole cell lysates probed with Cdc2 antibody (VMA00098) followed by detection with HRP conjugated Goat anti Mouse IgG (1/10,000, STAR207P) and visualized on the ChemiDoc™ MP with 25 second exposure. Arrow points to Cdc2 (molecular weight 34 kDa). Cdc2 antibody recognizes cyclin-dependent kinase 1, also known as cell cycle controller CDC2, cell division control protein 2 homolog, cell division cycle 2, G1 to S and G2 to M cell division protein kinase 1 or p34 protein kinase. Mouse anti Human Cdc2 antibody recognizes Cdc2, also known as cell cycle controller CDC2, cell division control protein 2 homolog, cell division cycle 2, cell division protein kinase 1 and p34 protein kinase. Cdc2 is a highly conserved protein with an important role in cell cycle progression and DNA break repair. Cdc2 overexpression in malignant tumor cells may play a role in tumor progression and be indicative of prognostic. 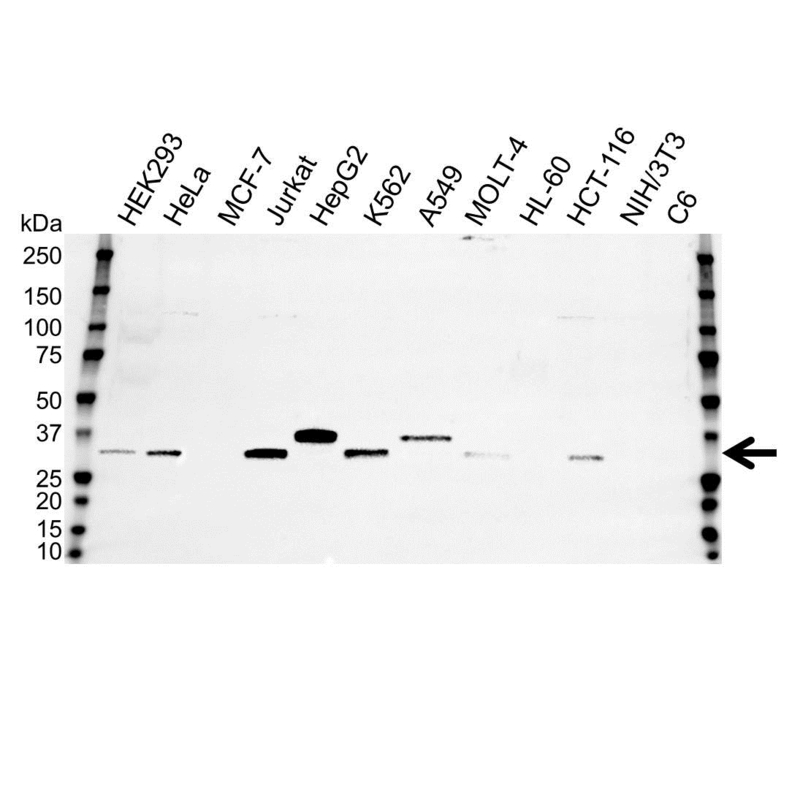 Mouse anti Human Cdc2 antibody detects a band of 34 kDa. The antibody has been extensively validated for western blotting using whole cell lysates. Anti Cdc2 detects a band of approximately 34 kDa in Jurkat cell lysates.